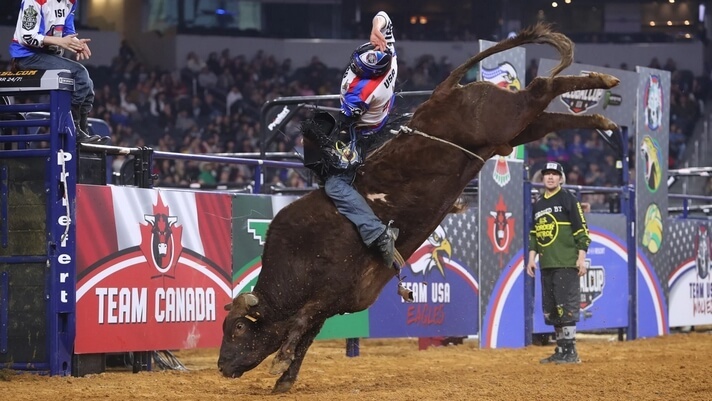 ARLINGTON, Texas – Ryan Dirteater was so excited on Sunday afternoon at AT&T Stadium that he could care less about talking about his own 3-for-3 performance at the WinStar World Casino & Resort Global Cup USA, presented by Monster Energy. The 29-year-old was being congratulated by all of his Team USA Wolves teammates following his 89.25-point ride on Bezerk, which propelled him to a second-place overall finish in the individual aggregate, when he paused. He then looked over at Stetson Lawrence, Keyshawn Whitehorse, Cannon Cravens, Cody Jesus, Justin Granger, Colten Jesse and Dakota Louis. Dirteater was instrumental in the Wolves finishing in third place (8-for-18) in their debut on the Global Cup stage. He began his Global Cup performance with rides aboard Boogie Bomb (85.75 points) and Scrappie (83.5 points) and finished 4.75 points behind Team USA Eagles’ Cooper Davis for the individual event average title and $30,000. Dirteater was not the only rider bringing the Native American crowd to its feet all weekend long. Cody Jesus finished 2-for-3, including an 88.5-point ride on Black Rose in Round 3 Sunday, despite having the flu earlier in the week and possibly a broken foot. Five of the seven Wolves picked up a qualified ride inside AT&T Stadium. Petersen loved the heart, determination and desire his team displayed. PBR Director of Livestock Cody Lambert commended the Wolves for their performance, as well as Dirteater for stepping up to the plate. Dirteater has ridden six consecutive bulls and heads into next weekend’s Mason Lowe Memorial in St. Louis as one of the hottest bull riders in the world. The No. 5-ranked bull rider in the world will be able to possibly gain ground on world No. 1 Jess Lockwood after Lockwood broke his left collarbone on Saturday night when he was bucked off by Wild Goose. Dirteater trails Lockwood by 1,262.5 points in the world standings. “I haven’t thought of it too much, too far,” Dirteater concluded. “I know if I just do my job, one at a time, the consistency will be there as long as I do my job. I know I’ve got the talent. I believe in myself. I work really hard. Everybody has their time at something.